For sale is a kid's cowboy suede leather jacket from the 1950s. It has lots of fringe and lots of 1950s Roy Roger / Hopalong Cassidy character. It does not have any labels on it so I don't know who made it or what size it is. Nice condition - very wearable! Shorts feel like they are made of a very heavy flannel and have button closure on each side. Shirt buttons to pants. waist to hem of shorts - 9 3/4". Made of cotton twill with a fun screen print tropical scene. The crop style top has a white cotton fringe. The shorts and pants have flat fronts, side pockets and elasticized backs for a perfect fit. The shirt has a nautical look w/white sailor collar w/blue stripes. Slightly puffed sleeves w/cuffs. Pants button on to shorts. Shirt has 3 front buttons - 7 waist buttons. 3 crotch buttons. A very cute little boy's short pants set from the 1930's. 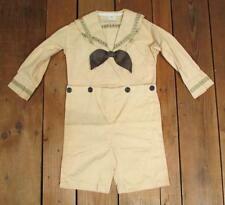 A very cute little boy's short pants set from the 1930's. The shirt has a white collar w/a blue stripe & 2 embroidered Art Deco style triangles. Short sleeves. Pants button on to shorts. Shirt has 4 front buttons - 8 waist buttons. UP FOR SALE IS A SUPER CUTE LOT OF 3 BUBBLE ROMPER OVERALLS . See Item Condition Section and photos. The skirt is mini, elastic waist, A-line. Still-so cute and lots of wear left. Sold as is. Shoulder to Shoulder 13". 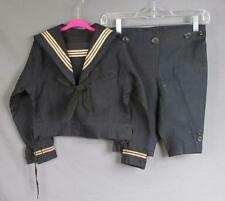 Super Cute Nautical New Port Sailor Suit/ Romper. Length: 15" from top of shoulder to leg hem. 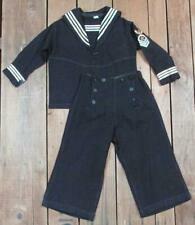 First mate navy blue sailor suit outfit with hat included! Overall features star buttons on front and criss cross back. 100% acrylic. Would make a perfect photoshoot outfit! Made in the USA! Size: Boys 4T. Smoke and pet free home. VTG 70s Boho Hippie Baby Girl Toddler Shirts Ric Rac Eyelet 18M 2T. Ready to wear or modify/repurpose. No holes, stains or tears. So flipping adorable. Shipped with USPS First Class Package. One of the shirt buttons is missing. I don't know if any of the butts are original to the set or not. Color Pale yellow with light brown accents. Condition No fading, stains, or holes. 2 front pockets. Waist has elastic in the back. Leg Opening 5.5 in. Length 7.25 in. Inseam 1 5/8 in. Waist 6 in. The jacket is made of silk with velvet collar and cuffs. Both of the hats are made of velvet. Vintage Red velvet Romper Valentine’s Jon Jon 2T Unisex. Shipped with USPS First Class Package. No flaws. 17.5” shoulder to saddle and 11” armpit to armpit. Smoke free pet free home. This outfit was so popular in the 1950's era. Special occasion outfits for children. Needs a string to tie the front of vest together. Back portion of vest is made of a heavy cotton felt material. Shirt 9" from pit to pit 8" long. In good pre-owned condition. Has a very faint mark on the right. It has all the characteristics of an official USN Cracker Jack Uniform. This Great little uniform appears to be authentic Military manufacturers make. Dark Blue, wool knit Top & Shorts. Shoulder to Shoulder (across front): 13". Vintage Baby Boys Size 2T Blue Suspender Shorts Set Easter Bow tie Embroidered. Condition is Pre-owned. adorable 3 piece vintage suspender shorts, bunny blouse, and bow tie! 12-18 months 15” shoulder to saddle 8.5” waist with stretch. No flaws. Smoke free pet free home. Vinyl lined diaper cover has flat front, gathered back. embroidered boat, boy, and puppy dog. Cute little baby boy cotton blend outfit. vinyl is supple with no pin holes. 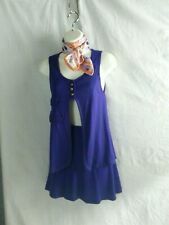 with button front short sleeve top. Has colorful clown circus print, original tie at neck back. Great colors and styling - Bright blue and primary color polka dots. Dual pockets in both shorts and pants. VTG MID CENTURY BABY BLUE AND WHITE TEDDY BEAR TWO PIECE SET SIZE 6 MONTHS VERY GOOD CONDITION.SUPER ADORABLE AND CUTE! VERY RARE FIND. TWO MATCHING PIECES, ONE ONE PIECE AND A MATCHING SWEATER. Made from a cotton polyester blend, with a cute train on them, marked size 4T with no makers label (may have been removed?). Shorts Waist (laying flat with back elastic unstretched) 11". Shirt armpit to armpit (laying flat) 12 1/2". Outfit that ties on the sides size 18-24 months In great condition. The jacket is a light blue pinstripe and features a 3-button front closure, v-neck, nautical patch on the chest, two front pockets, and shoulder pads! The blue pants feature elastic at the back of the waist and pleats in the front. The vest is red and features a 3-button front closure, v-neck, nautical patch on the chest, and two small front pockets. The blue and white striped shirt features a button front. Very good condition, with one tiny spot on the shirt collar. Satin lined jacket, flannel lined pants. Style :Children / Baby Girl Outfit : 2 Pieces : Blouse Top with Matching Pants. Details :A-Line Pleated Blouse with Puffy Sleeves & Back Buttons closure - Bell Bottoms Pants with Elasticized Waist - No Lining. Cream colored cardigan sweater with ribbon ties, matching bonnet with ribbon ties, and matching booties. It does need a washing, a bit dusty. Length 8.5". The yarn used has a streak of shinier threads, gives it a little more depth. This is an adorable outfit. The jacket sleeves they are shorter sleeves more like 1/2-3/4. The pants are cropped. Well kept. See photos for details. Blue stripes and white buttons. Two very small stains on sleeves as shown in pictures. Also, one small stain on inside of jacket that cannot be seen when worn as shown in pictures. Length shoulder to hem is 10.5". Naval~Sailors Outfit, from the 1950's. several small spots of 'mothing' at front of Shirt & also a few on front of pants. with matching Pants/Trousers. Pants are 8-button, front-flap. also a 'mothing' spot at lower leg, on back. It has turn off white grayish over the many years. Vintage velvet romper and top set. 15” shoulder to saddle and 10” armpit to armpit. Best for 9-12 months. No flaws. Smoke free pet free home. Snaps at saddle. Ivory color, Gabardine or fine Twill-type material. Shirt/Top is Long sleeve. (Only 2 very tiny marks where Outfit was pinned, when in Storage). with a Sailors 'Cracker Jack' Collar. Brown Bow, below collar & Beautiful. Separate shirt and romper Dungarees. Unisex baby suit. Thin Polyester. Unused but washed. Gorgeous separate blue and white gingham two piece featuring darling little veg and fruit embroidered on top and frilly leggings with poppers for ease of changing.